I have been reading Bill McKibben’s new book, Oil and Honey: The Education of an Unlikely Activist, with a group of students in a course called Media Strategies for Social and Environmental Justice Advocacy that I’m offering for the first time this semester at Bard College at Simon’s Rock. Oil and Honey tells the story of how McKibben founded 350.org with a group of his students at Middlebury College in 2009, and how together they went on to become the most visible American environmental organization of our time, leading the U.S. protests against the Keystone XL pipeline and creating an international movement to put pressure on governments and policy makers to quickly and decisively address the mounting threats of climate change. Most recently, McKibben has been focusing on divestment as a tactic to push the fossil fuel industry to shift into cleaner forms of energy production. Taking its cue from the successful anti-apartheid divestment campaigns of the 1980s, the strategy is to awaken enough ordinary citizens–including college students, church-goers and workers of every stripe–to the perils of climate change, and get them to press their hometowns, companies, churches and colleges or schools to divest their endowments, retirement funds and other collectively held investment portfolios from the fossil fuel industry. It seems like a good strategy, and yet it did not elicit much enthusiasm from the students in my class. They were more interested in thinking about how to educate younger kids about the beauty and value of the natural world, and moving from that basic platform out into activism. Kids today spend so much time indoors, in front of screens, that they have little sense of connection to nature, my students said. And without that connection, it’s very hard to understand why it’s important. What’s all the fuss about? This is what it’s about. 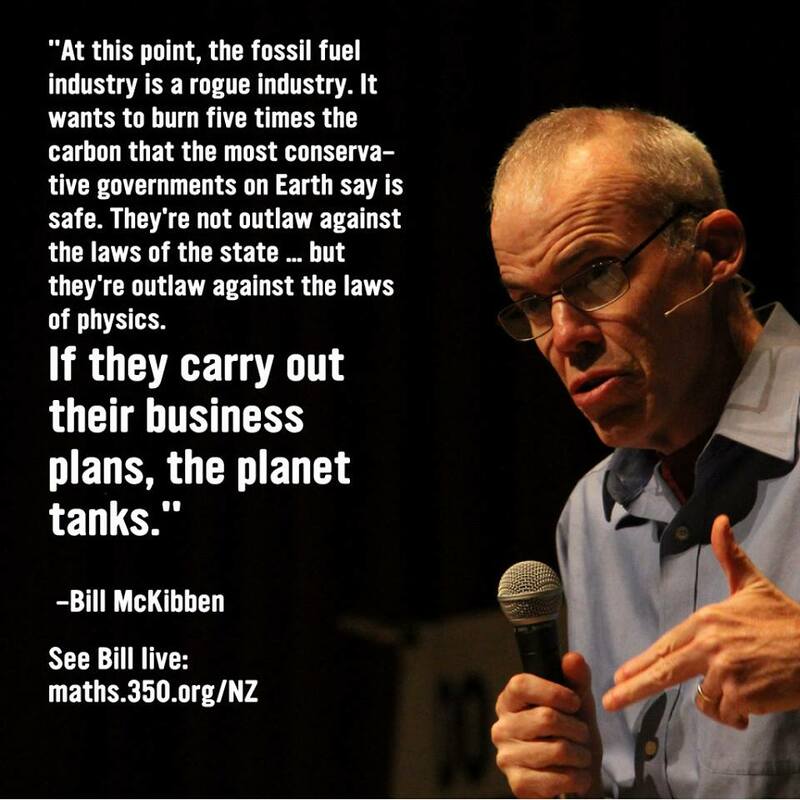 Bill McKibben asks us to “do the math” and understand that if we were to actually succeed in burning all the fossil fuels that are currently in the ground, we would heat our planet to a level not seen for millions of years. It would definitely be game over for human civilization, and it would take millions of years for the planet to restabilize. What it is about this simple math that human beings today do not want to see and understand? Part of it is simply that we’re so easily distracted. The big news yesterday was that Federal Aviation Administration will now allow airline passengers to use their computers and tablets right through take-off and landing. We can be in front of our screens to the very last second of the day! Meanwhile, while we’re busy on our computers, not paying attention, the fossil fuel industry is going around the resistance to the Keystone XL pipeline by massively investing in railway terminals, lines and cars for carrying its tar sands oil down to refineries and tankers on the coasts. 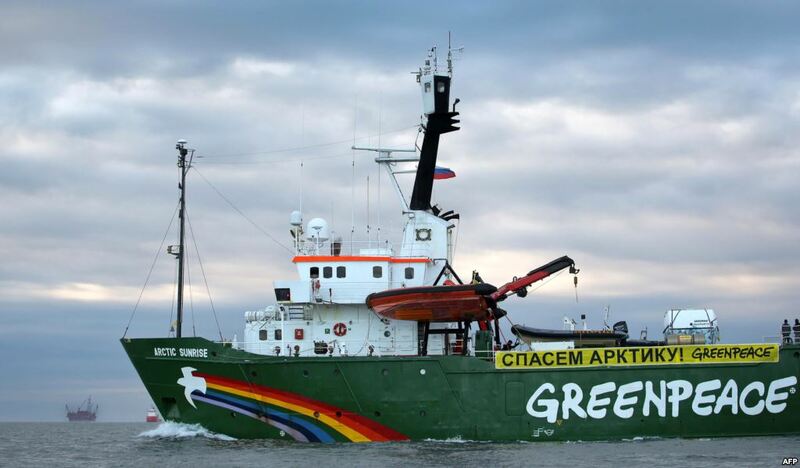 And up in the darkness of the Russian tundra, 30 Greenpeace activists are languishing in cold solitary prison cells, held without trial for the crime of trying to raise awareness about the destruction of the Arctic by Russian and international oil drilling. In the book Oil and Honey, McKibben ingeniously compares corporate behavior to bee behavior. Corporations are like bees, he says, in being relentlessly “simple” and focused on their one crucial task—for bees, making honey; for corporations, making profit. They don’t change their focus, no matter what. But humans are more complex than that. We can change and adapt to new circumstances. We can recognize and act upon moral imperatives. We don’t have to follow suicidal corporations blindly over a cliff of their own making. Although it’s true that the alarming dependence of Americans on screens of every size can get in the way of a connection to the natural world, on the other hand, the fact that so many people are networked together through the media presents great opportunities for activism and change. With my students this semester, I’ll be thinking about how to harness the power of the media to create a different kind of swarm—not following our current corporate leaders, but moving in an entirely different direction. We’re not alone—there are many groups working on this now, from the Transition Town movement to the Pachamama Alliance to even such formerly mainstream organizations as the Sierra Club. The task: to awaken a critical mass of people, worldwide, to the reality that we are living in an end-time of biblical stature; and to get them to understand that we have the power to change the storyline from doom-and-gloom cataclysm to a positive shift into a whole new relationship of humans to our planetary home. 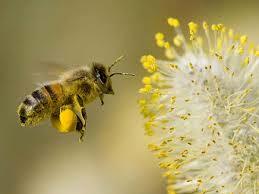 Working cooperatively, bees are able to turn small grains of pollen into vast tubs of honey. Human beings can do that too–when we work together for a common cause we can do almost anything. It’s time to Occupy Congress! I live in the southern region of the US. In my experience, many “churched” southerners are lukewarm about environmental issues. One only has to scan church newsletters to understand how fun social events are distracting believers from engaging in meaningful dialogue about the sorry state of the planet. Hopefully, the ecumenical Christian churches in Europe will lead by example, encouraging their members to reduce energy needs and switch to renewable sources. There’s absolutely no excuse why Christian organizations located in the sunny American south can’t do the same. thanks for this fine review of bill’s new book. will be looking for it . . .
You know I share this passion and the question of how to engage people. I would love to come to your class sometime and listen to their ideas. Divestment was so successful in the fight against apartheid. I wonder if it would work here, though. The way the major corporations make money off of fossil fuel and other dirty energy sources seems quite different from how the big universities and banks invested an profited from apartheid South Africa. I fear the most fundamentalist southern churches cannot hear the message because of their belief in the end of the world–if life on earth will end anyway, what’s the use of caring for our resources? At the moment I am inclined to believe that one of the ways to get people to understand our fragile and rapidly changing climate is by pointing to the mammoth storms that are ravaging almost every part of the country and world. Of course the Christian fundamentalist see these storms as indicative of a coming Armageddon, but saner minds must see that they are the result of climate mismanagement. I have the same questions you have about divestment and also the possibility of getting fundamentalist Christians to embrace the message. 350.org has been quite successful with organizing “the choir” into meaningful actions. But even those actions come with many complications. Braydon Point power plan in Somerset, MA is one of Massachusetts’ heaviest polluters. It will be shut down in 2017. Demonstrations against Braydon Point were organized by 350.org and did a great job of bringing attention to its flaws. This had some impact on the decision to shut it down, but is not the primary reason, and certainly not the stated reason. Meanwhile, the shut-down will cause a lot of unemployment and loss of tax revenue in Somerset. So, while environmentalists see the shut-down as a victory, many of the people that we are trying to “bring into the fold” see the shut-down as a bad thing. Until we are able to provide clean energy jobs (with adequate training and good pay) to those who are employed in the fossil fuel industry it will be difficult to get their support. Even if regulations and the cost of upgrades to meet the new regulations force owners to shut down, the impact on the workers remains an issue about which the environmental movement has to be concerned. So, back to the question of getting people to embrace the message. I am experimenting with fiction as way to move people. So many people’s eyes glaze over when they hear facts, statistics, etc. They need something that moves them emotionally. As you suggested, the mammoth storms do that for some. I have written a visionary fiction novel that creates a not too distant future where life as we know it now is completely impossible. It is a bleak picture, but it is only a small part of the first book. I hoped to draw people into the story first and leave them with a message as a by-product. Today, I am beginning the sequel. It will spend a lot more time in that bleak future. Hopefully, I will be successful in keeping readers because they care about the characters. Although I Call Myself Earth Girl has only sold 500 copies so far, I have received FB messages and emails from readers who say that the message haunts them and has caused them to think about what is happening to our environment, and what they can do about it. A slow start, yes….but it is one more tool in the long and complicated quest to inform and engage people to the point where a majority of us are actively working to solve this problem. Please wish me luck as I begin! Sadly, it’s true. . .many southern Christian congregations are operating within a comfortable cocoon, offering diverse fellowship activities and evangelizing as a means of increasing church membership. My dad was a Catholic and for most of my childhood I was too. The further south I moved, the more I learned about the Bible Belt. For several years I attended Sunday services and weekly Bible studies at a southern Baptist church. The in-depth studies intrigued me because as a Catholic girl, I had never learned much about the Bible. Scripture is full of beautiful imagery about the wonders and life affirming order of the natural world — yet many conservative Christians lack respect or humility for God the Creator. I left the church when $70,000.00 was spent on drapes to darken the sanctuary during theatrical performances. Great to hear you’re starting the sequel, Jan! Yes, I really believe that a grassroots movement could be very powerful, but people won’t get involved unless they feel –really feel–how important it is to do so. Getting people to think about their children and grandchildren seems like a good approach. Sure works for me. Jennifer, I totally agree about the “all of the above.” My thoughts about divestment have little to do with the fact that it is “dry” – more to do with the fact that these companies are so entrenched in so many aspects of our economy that there will be much hesitancy to divest. Have to get offline now and start writing!!! So glad you are turning to fiction to get this message out. I agree that fiction often can do what dry fact-filled articles cannot. I want to read I CALL MYSELF EARTH GIRL and its sequel. I still find Marge Piercy’s HE, SHE AND IT to be one of the most powerful books about what we are doing to the earth and environment. It was written more than 20 years ago, and seems totally current. Margaret, I agree with you about Marge Piercy. You can get my book at some bookstores (most will order if it is not there), also at all the online stores (Amazon, B&N, etc.) It is also available in all ebook formats for under 6.00.